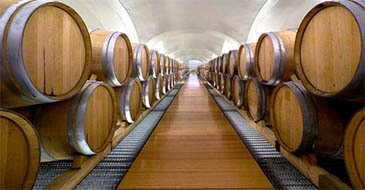 PAMPERED BARRELS: The sleek new cellar of Feudi di San Gregorio in Campania, Italy. 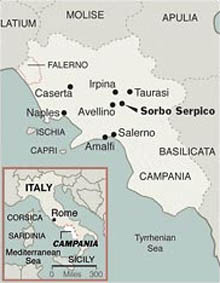 SORBO SERPICO, Italy — Rolling hills carpeted with vineyards surround this tiny village in the Irpinia region of Campania here in southern Italy, where the landscape has hardly changed for centuries. Then it hits your eye, a sleek structure of glass, brushed steel and concrete, Feudi di San Gregorio's new $25 million winery and hospitality center, as likely a feature of this countryside as an alien spaceship. Huge diesel buses, miles from the tourist centers of Naples and the Amalfi coast, idle in the parking lot, awaiting the scores of German and Dutch visitors who are touring the building, which was designed by the Japanese architect Hikaru Mori, who lives in Milan. 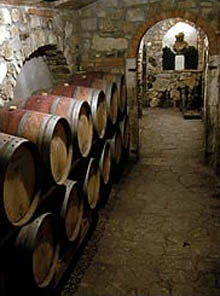 Perhaps the tourists have descended into the chaste white earthquake-resistant cellar, where thousands of barrels are soothed around the clock by 16th-century madrigals written by Carlo Gesualdo, an Irpinian composer infamous for having murdered his wife. Maybe they are sitting in the glass-enclosed tasting room, in sculptured chairs of soft leather. Or maybe they have descended on Marennà, a modern restaurant that has already won wide acclaim for its refined dining. It's a huge change for Campania, which for centuries has been a viticultural backwater in a country that is an ocean of wine. While the world discovered the great wines of northern Italy, the Barolos and Barbarescos of Piedmont, and the Brunellos and modern blends of Tuscany, Campania and the rest of the south was given little thought. The prosperous, industrialized northern Italians have always dismissed the southerners' rustic wines, made from unknown indigenous grapes. But Campania and the south have never accepted the north's version of the truth. And in the last decade the rapid pace of progress has transformed Campania and its neighboring province of Basilicata into the most exciting winemaking areas in Italy. And unlike the north, which initially attracted attention with wines made from French varietals like cabernet sauvignon and merlot, Campania is doing it with grapes that were growing in the region even before Vesuvius buried Pompeii. Crisp, mineral-laden whites, made from grapes that can be traced back to ancient Greece, belie the image of Italian white wines as mere thirst quenchers. Fascinating reds are being produced from grapes so obscure they cannot be found in even the latest wine guides. Most important, though, are the fine red wines made from aglianico (pronounced ah-lee-ahn-EE-co), another grape with origins in ancient Greece. Like nebbiolo, the grape of Barolo, aglianico can be tough and tannic, with flavors reminiscent of tar and tobacco. But it softens faster and, like pinot noir, the aromas and flavors of aglianico differ markedly depending on the soil and climate in which it grows. North of Naples in the Falerno area near the Tyrrhenian coast, aglianico has a full, earthy, almost floral character. To the south, around the ancient Greek settlement of Paestum, the wines seem tighter, with a light smokiness and herbal quality. Inland in the Taurasi zone, where aglianico is planted on the foothills of the Apennine mountains, and in Basilicata, where vines grow on the slopes of Mount Vulture (pronounced vul-TOUR-ay), the wines are structured and complex, with minerality that comes from volcanic soil. "I consider aglianico with nebbiolo probably the most important Italian indigenous varietals," said Riccardo Cotarella, an oenologist who has worked with some of Campania's most important winemakers. Feudi di San Gregorio, one of Mr. Cotarella's clients, is the best financed and perhaps the most innovative of the south's newer winemakers. But while its new facility is a striking addition to the Campanian countryside, Feudi's high-spending approach is far from ordinary. The most exciting new producers in Campania and Basilicata characteristically come from farm families that have grown grapes for centuries. These families typically sold their grapes for meager prices to big producers, to be made into cheap wine. In tough economic times, when grape prices went down, these families struggled even more than usual. "We had to try something else," said Salvatore Fucci, whose vineyard is in the heart of the Vulture area in Basilicata. "Growing grapes, we couldn't live. Necessity forced us to do this." With barely enough financing, Mr. Fucci and his family went into the winemaking business. The estate's first commercial vintage, 2000, was released under the label Elena Fucci, named for Mr. Fucci's daughter, who is studying winemaking in Pisa. He has received good reviews, though not good enough for Mr. Fucci to feel comfortable in his new life. "We're not Tuscan," he said. "Here, things assume another dimension. We worry about bad things. The weather. We used to have to pay people to take our grapes." The litany of landowners turned winemakers seemed endless: Fattoria Galardi, whose austere, complex Terra di Lavoro wines have been rapturously praised by Robert M. Parker Jr., the influential wine critic; De Conciliis and Luigi Maffini along the southern coast; Antonio Caggiano in Taurasi and Villa Raiano in Avellino; Salvatore Molettieri in Irpinia; Masseria Felicia near Caserta. They all began making wine in the 1990's after decades if not centuries of growing grapes. "In Caserta 10 years ago there were 5 estates; now there are 28," said Nicola Trabucco, an agronomist who counts 15 properties in northern Campania among his clients. "In Benevento there are 50 new estates in the last five years." Before the avalanche of new producers, one winemaker, Mastroberardino, held the torch high for Campania. Since 1878 Mastroberardino has been producing fine red wines from aglianico and whites from grapes like greco, fiano and falanghina. Almost alone it carefully tended the traditions, asserting a place for the wines that the rest of the world seemed to spurn. "There is a strong conviction that we have an extraordinary patrimony," said Piero Mastroberardino, who runs the winery with his father, Antonio. "Twenty years ago maybe one or two wineries were making Taurasi. Now there are 30 or 40." For elegance and complexity, few wines in Campania can match Mastroberardino's Taurasi Radici, a tar- and mineral-flavored wine that, like Barolo or Burgundy, can take on the aroma of truffles as it ages and can last for decades. Because Campania was ignored for so long, it is still catching up with the scientific advances that are taken for granted in most of the modern winemaking world. Grapes like chardonnay, pinot noir and cabernet have been thoroughly analyzed, allowing farmers to select clones and rootstocks best suited for particular combinations of soil and climate. But scientists have barely scratched the surface on the grapes of Campania. "Research on aglianico has been going on for a few years," Mr. Mastroberardino said, "but for greco, fiano and the others, it is just beginning." The transition from small grower to grower-producer has occurred all over the wine-producing world as farmers have figured out where the money is. But it's happening in Campania and Basilicata decades after regions like Piedmont, which went through its own shakeout in the 1960's and 70's. In Campania growers saw what happened in the mid-1990's, when Mr. Parker raved about new estates like Galardi and Montevetrano, which have since become the equivalent of cult wineries. But government loans and subsidies, available in the 1990's for existing farms, also encouraged growers to improve vineyards and cellars with new vines and new equipment, and to start bottling their own wine. Typically for this land of contrasts, where the undulating pastoral beauty of olive groves and tobacco fields is defiled by slag heaps alongside mountains that have been gouged to make cement, the loans that helped so many in the last decade are squeezing these new producers, who must now repay the money they borrowed. With the slower economy, many of these wineries are facing frightening choices. "Many new estates, with good potential, don't have the resources to wait out a bad market," Mr. Trabucco, the agronomist, said. "You need two or three years' investment to carry you through. They don't have it, so they look for an immediate return." By that they mean high scores from influential critics who can cause a run on a particular wine. Many producers, believing that Mr. Parker's publication, The Wine Advocate, favors inky, powerful, concentrated wines with plenty of new oak flavor, try to make wines in that style, often at the expense of aglianico's characteristic medium body and earthy flavors. Many winemakers were inspired by the success of Montevetrano, in southern Campania, which was started by Silvia Imparato, a photographer who caught the wine bug in the mid-1980's. With the help of Mr. Cotarella and his brother, Renzo, a winemaker for Antinori in Tuscany, she made 1,000 bottles of her first vintage, 1991. She had wanted to make a wine purely of aglianico, she said, but Mr. Cotarella, who is from Umbria, refused. Instead, Mr. Cotarella, who had made his reputation working with Bordeaux varietals, insisted on 60 percent cabernet sauvignon, 30 percent merlot and 10 percent aglianico. "In the beginning I didn't trust this region, because there weren't any important wines," Mr. Cotarella says now. Ms. Imparato's wines, plummy yet light-bodied, with scents of cedar and tobacco, are now sought all over the world. Several years after he began with Montevetrano, Mr. Cotarella began working with Galardi and with Feudi di San Gregorio. With Galardi, he makes one of Campania's most profound wines, Terra di Lavoro, out of aglianico and piedirosso, an indigenous grape that is often blended with aglianico. "Montevetrano showed me the potential of the region, and Galardi showed me the potential of the indigenous grapes," he said. "Both represent what it can mean to work in the region with the right philosophy, the right terroir and the right varietals." Montevetrano, with its use of familiar international grapes like cabernet and merlot, is practically unique in Campania. Recently Mr. Cotarella recommended to another client, Alois, that it rip out its small plot of cabernet and instead plant casavecchia, an obscure, ancient red grape that is only now being studied. Alois, near Caserta, complied and now makes a silky, minerally 100 percent casavecchia, which it calls Trebulanum. Another producer, Vestini Campagnano, specializes in little-known indigenous grapes like casavecchia and pallagrello, which in its bianco form makes soft, supple white, and in its nero form makes powerhouse reds. By many estimates the older vineyards of Campania and Basilicata hold dozens of grape varieties waiting to be rediscovered. Back at Feudi di San Gregorio, Mr. Cotarella is working on a new project, sparkling wine. Almost every region of Italy produces spumante, though Campania has yet to create a market for its own. Mr. Cotarella has enlisted as an adviser Anselme Selosse, winemaker of Jacques Selosse, a small but important Champagne house, but Mr. Selosse will not be coming to teach the Italians about chardonnay and pinot noir. Instead they will be making sparkling wine with greco, falanghina and fiano. "The French people," Mr. Cotarella said with relish, "they are very jealous!"